Balance, deep relaxation, and rejuvenation - ephemeral ideals in our harried world - can be fully attained in the unique paradise that is North Island. North Island is one of the inner granitic islands of the pure and breathtaking Seychelles archipelago, located in the azure Indian Ocean, midway between India and Africa. 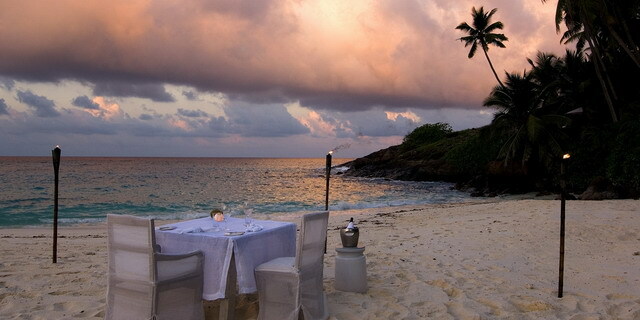 The island exudes exclusivity, and delights and refines every human sense. Here the soul and nature are restored simultaneously in an holistic conservation program, which links the environment, guests, the lodge and its staff. North Island presents a paragon of contrasts, from its bald granitic peaks, through lush verdant rainforest and powdery bone-white beaches, to the rolling turquoise sea stretching to the horizon. Sight, sound, touch, taste and smell are activated and integrated in an epiphany of romance and pleasure. The lodge itself reinforces the theme of complimentary contrasts, with spaces becoming progressively more refined from soft sun-bleached exteriors, supported by the sinewy root structures of enormous driftwood trees turned upside down, to the deeply polished hardwood interiors, incorporating hand-blown glass, delicate white coral, seashells and bright white textiles. Guests are accommodated in eleven sea-facing villas, each comprising 3,000 square feet of sculptural elegance, including a luxuriously proportioned main bedroom with fully retractable glass walls; a writing and dressing area, a kitchen complete with a well-stocked bar, home-made ice cream, and an Italian cappuccino machine; a large second bedroom that can be converted into a study; a sun deck with massage table; and a covered sitting area. A private plunge pool and cushioned "sala" completes this private sanctuary within a sanctuary. A full butler service caters for guests' every need, from breakfast in bed to picnics on secluded beaches. An exceptionally vast en-suite bathroom deserves special mention. The enormous Japanese soaking tub is perfectly proportioned for two. Double vanities resembling smooth worn coral, an indoor rain shower and an outdoor shower with water cascading from a wooden trough provide the ultimate in bathing indulgence. After a candle-lit bath, replete with incense, retire to the marshmallow-like chaise lounge and revel in profligate bliss. 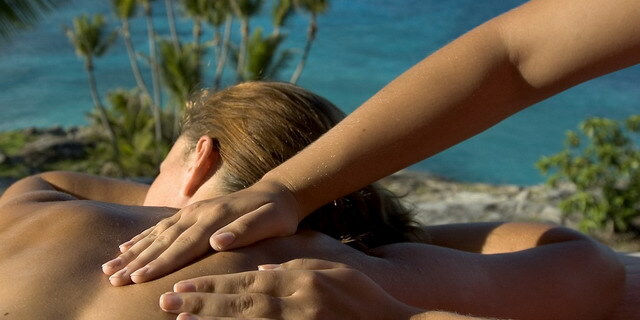 A clear focus of North Island is rejuvenation through comfort, relaxation, and tranquility. Activities are numerous and varied - scuba diving, snorkeling, sea kayaking, cycling, guided eco walks, and fishing to name a few - but there are no schedules. Everything on North Island revolves around the individual. Whether working out at the well equipped gym, or luxuriating in a sumptuous treatment at the health spa, one's attention is constantly drawn to the perfection of the setting. Dining is a sensory delight and meals are taken on romantic private beaches, in your villa, and on various secluded decks. Whatever the venue, the bleached wood table is inevitably laid with gossamer coverings, crisp white linen napkins, gleaming silver, and thin bone china. North Island cuisine is superlative and incorporates spicy, sour, salty and sweet into every fresh and extraordinary mouthful. Paired with icy white wine, the Indonesian and creole flavors burst like island orchids on the palate. Service and attention to detail is paramount at North Island where the answer is always a resounding "yes!". Each guest is coveted and cocooned in this island paradise and made to feel like the most important person on earth - floating yet firmly rooted - Balanced! Villa 11 can only accommodate two adults, the design of the villa is to create the ideal "honeymooners" retreat and does not have a second bedroom facility. 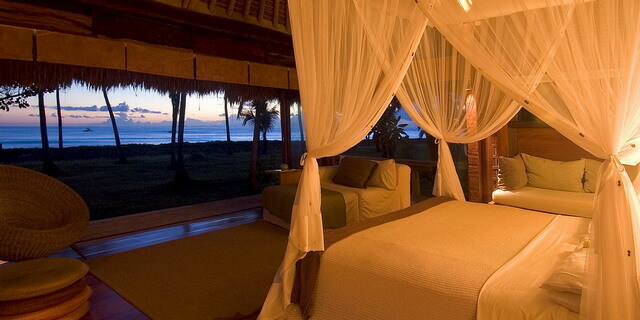 North Island is a Luxury Beach Lodge Located in Seychelles's Inner Islands (Seychelles).